Courtesy photo: The George S. Mickelson Award was presented to members of the Swiftel Center staff at the 2019 South Dakota Governor’s Conference on Tourism. From left are South Dakota Gov. Kristi Noem, Swiftel Center Event Manager Ashley Biggar, Swiftel Center Sales & Marketing Manager Kristina Lankow and South Dakota Secretary of Tourism Jim Hagen. Midwest hospitality at its best. That’s the philosophy at the Swiftel Center. That motto has rung true as the Swiftel Center has been awarded the 2018 George S. Mickelson Great Service Award. 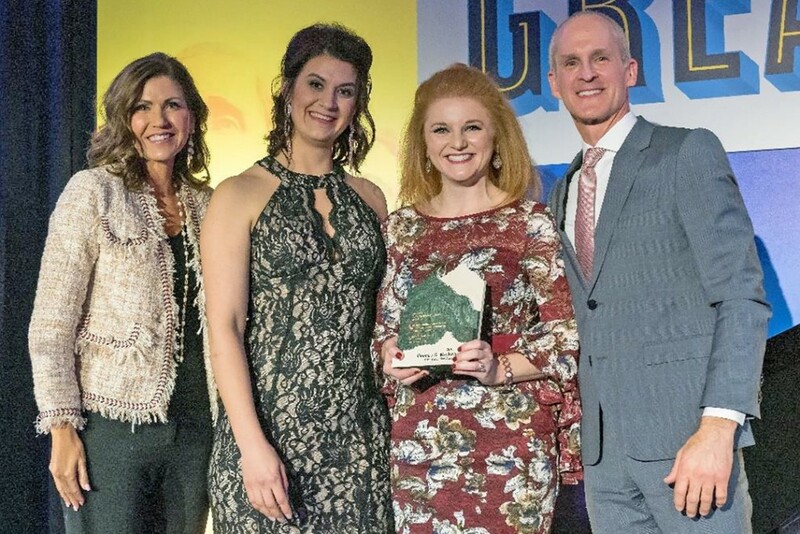 The award was presented to members of the Swiftel Center staff by South Dakota Governor Kristi Noem and South Dakota Secretary of Tourism Jim Hagen at the 2019 Governor’s Conference on Tourism. Team members – including all Swiftel Center full-time and part time staff – are encouraged to continuously consider the four basic needs of any guest: to feel welcome, to feel important, to be understood, and to be safe and comfortable. The staff at the Swiftel Center strives to provide excellence customer service that upholds these four needs. At the Swiftel Center, each department hosts an annual training to introduce part-time staff to new hospitality materials and review policies and procedures. The Swiftel Center also provides yearly training to motivate and teach new customer service skills. To collect feedback from customers, patrons, guests and clients, the Swiftel Center sends a client satisfaction survey. Employee appreciation parties provide an opportunity to recognize staff achievements, while “high five” cards are used to let staff members know when they are doing an awesome job. The George S. Mickelson Great Service Award honors businesses or organizations that have done an exemplary job of exceeding visitors’ expectations in customer service. It marks the culmination of a yearly hospitality program that involves hospitality training, customer comment cards, an employee recognition program, and an application for the Great Service Star designation. To learn more about the award and view a list of recipients, visit https://sdvisit.com/tourism-awards/2017-george-s-mickelson-great-service-awards. For more information on the Swiftel Center, visit www.swiftelcenter.com, call 692-7539 or follow at www.facebook.com/swiftelcenter.